​Hi there everyone, welcome back to another episode of The Art of Business English. I hope your guys are having a fantastic week of work and fun. Have you ever wondered what is the difference between Will and Going to? I mean they are both used for talking about the future, right? Well, yes that is correct, however there are some differences in use that can be a bit confusing for non-native speakers. In this episode I am going to explain how we use future simple and going to. Not only that, I am also going to show you guys how it is similar and different in use in the context of Spanish. Basically, I am going to show you the do’s and don’ts of using the future in English. So, if you have problems understanding when is the right time to use will or going to, then stay tuned because this episode is going to be super useful for you. community now!" level="1" login="0" short="true"
Will + s + verb + object? Will they attend the event? It is important to note that the contracted form of will is very common and it can be a little difficult for non-native speakers to understand when a native person speaks quickly. Another important point to note is that the will remains the same for all subjects. It doesn’t change for the 3rd person singular. I think it’ll be very hot at that time of year. We’ll probably stay at a hotel near the airport. A bonus will be awarded at the end of the quarter to the team member with the most sales. I’ll call you back in a moment. Don’t worry, I’ll finished the report by the end of the day. and so on. So, we can see that with Spanish the verb go, has the future added to it at the end of the verb, indicating the tense and the subject. In English, we put the subject first, then will to show the future tense and then the verb. If we can agree that this is how we translate the future from Spanish to English, then in general we could assume that it is easy to use the future simple. This is true to a certain extent, however there are some differences that we need to be aware of. Firstly, we can’t use will for things that are definitely planned or we have a strong intention to do. For example, if I ask you, “What are you doing this weekend”, then you can’t say “I will go to the beach”. Why? Well, you have a strong intention or plan to go to the beach. Here we would have to say “I am going to the beach”. On a positive note, if you use will incorrectly, then a native person will understand you, it will just sound wrong to them. Secondly, we must use future simple when talking about the immediate future, or something you decide to do at the moment of speaking. Let’s take a look at what I mean. In Spanish you can say, “Ahora te llamo”. This basically means that you will call the person back in the near future. However, you will notice that in Spanish we have used the simple present tense and we have used the word ahora, or now. Get it straight in your mind, now is now in English. It is the very exact moment of the present. Secondly, the present simple is the present simple and you can’t use it to talk about something you plan to do in the future. So, for this expression to be translated correctly, you would have to say, “I will call you right back”. You can’t say, “I call you now”. So, to summarise, we use will to talk about things we have decided to do at the moment we are speaking or for the immediate future. These are the two most common mistakes I see with the future simple use in English. Let’s take a look at going to. We are going to hire a new marketing manager. We are not going to accept the new conditions. Am/Is/Are + s + going to + verb + object? Are you going to be at the monthly managers meeting? A quick thing to note is that going to can often mean the same thing as present continuous for future use and will. ​Let’s take a look at a comparative. Are you going to be attending the annual general meeting? Will you be attending the annual general meeting? Are you attending the annual general meeting? We’re going to increase our sales team by around 10% (We intend to expand the team but we haven’t hired the new people yet). Judging by these sales forecast, we are going to have a strong 3rd quarter. (I am making a prediction based on the information I have now in the present). So, now that we understand both will and going to, let’s look at how they are similar. The reason why we use these words is because they are all closely related to the speakers opinion about future events. In many cases when we are giving our opinion we commonly use will, however, we can also often use both will and going to. Let’s take a look at a few examples. I think it’s going to be a successful product launch, or I think it’ll be a successful product launch. I am sure they’ll accept the new contract conditions, or I’m sure they’re going to accept the new contract conditions. I doubt they’ll be happy when they hear about the changes, or I doubt they’re going to be happy when they hear about the changes. I’m sure you will see the value in our products. We feel that there will be strong growth in the housing sector. I have no doubt that if you try this service you will love it. We’ll reconvene this meeting in a week. We’ll probably organise a sales event next month. I will meet you next week to finalise the contract. I’ll be right back, would anyone like a coffee? I’ll answer any questions you have at the end of the talk. We’ll give you a further 10% discount if you sign today. I’ll send you a report on this by the end of the week. I’ll make sure you all receive a free sample. I’ll give you a free 30 minute coaching call when you purchase any of my courses. We are going to employ two new sales reps.
I’m going to invite you all to lunch at the end of this talk. We are going to ensure you receive all of your inventory within 30 days. If we don’t hurry up, we are not going to have enough time to cover all the points. As you can see, based on these numbers, we are going to need to promote our products further. At these prices we are going to sell out very soon. ​So, to wrap things up, we can see that there are quite a few differences and similarities between will and going to. The best way to appreciate these differences is by understand the use of each future within the correct context. Of course, practice makes perfect. If you stick to the simple rules outlined in this episode then 9 times out of 10 you will use these two future forms correctly. Just remember, if you do use will and going to incorrectly then you will still be understood by a native person. As always, please like, share and comment on this episode. 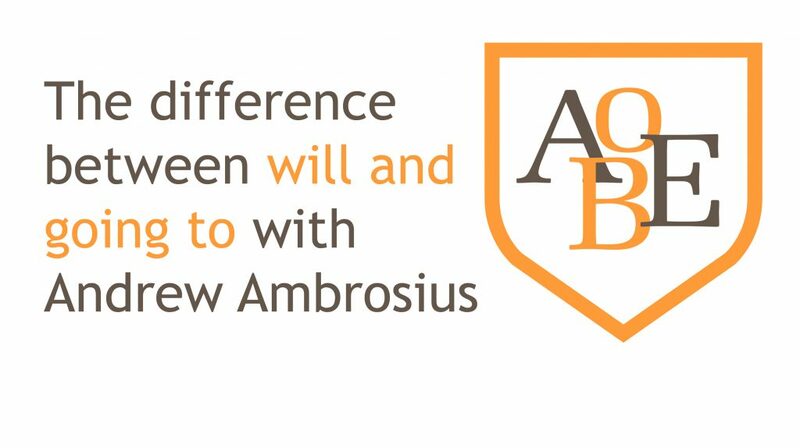 If you have any additional questions regarding the differences between will and going to then please contact us on our Facebook page at www.facebook.com/theaobe, or leave us a comment over at the AOBE. ​Till next time, take care and enjoy improving your business English. 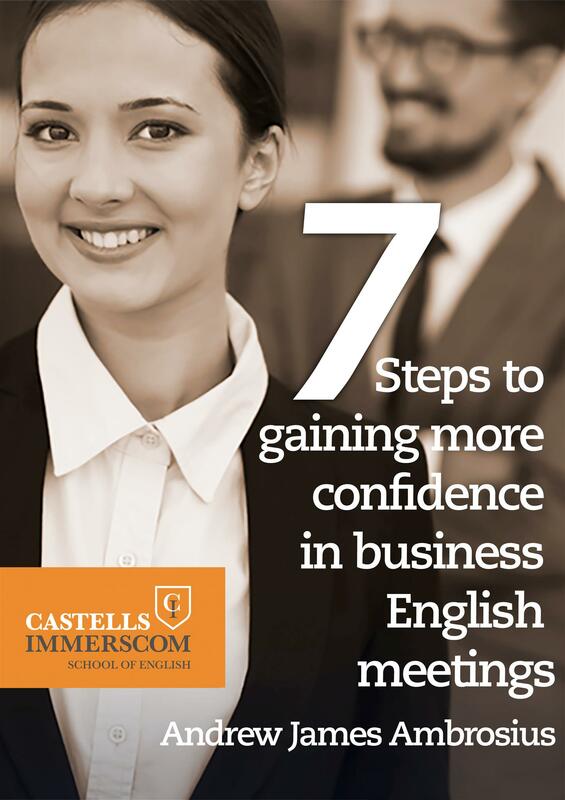 Discover the small steps that will improve your English, help you gain confidence and lead to more sales in your next business English meeting.